Our most popular power source is electric motors. 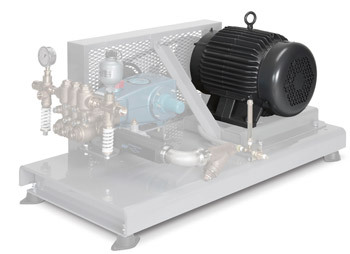 Available in sizes ranging from .23 to 200 HP from various manufacturers. For portable applications or installations that do not have an electric source available, we have a variety of gas engine sizes available from various manufacturers. For portable or higher horsepower installations, we have built a variety of diesel custom systems. For custom systems being installed where hydraulics are available, we offer a variety of hydraulic motors to meet your application needs. For explosive environments or where an air source is plentiful, we have a variety of pneumatic (air-driven) motors available.